Set over two floors, both overlooking the stunning Albert Dock, a ground floor sun terrace with seating for 30 guests and an upstairs champagne balcony overlooking the dock, it’s a truly stunning venue. Our menu is large plates at lunchtime and tapas in the evening, with a large list of changing daily specials. We have a more extensive breakfast menu, great deals for children, too, and as ever, breastfeeding mums very welcome and always offered a free drink on the house. We can’t wait to see you. Hasta Pronto! We are next to the Beatles Story in the Albert Dock in a stunning unit, with the original arched ceilings, brickwork and flagstone floors from two centuries ago, and a glorious sun terrace. 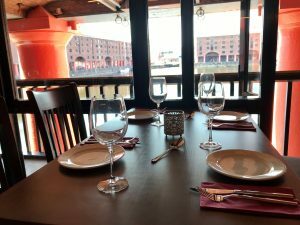 Intimate, moody bar, cafe and deli downstairs with a beautiful upstairs dining room overlooking the dock, perfect for large gatherings, parties, weddings and corporate events, we can cater for groups large (up to 100) and small. Similar to our two Lunyas in Liverpool and Manchester but noticeably different too, slightly different style, menus and vibe. Follow us on Twitter @lunyalita, Instagram @Lunyalita or Facebook for regular updates or join our mailing list for more info. All finish times are the times of last seating of tables. The restaurant closes approximately 1 and a half hours later. The deli & bar is open all of this time. Whenever there is a large concert on at the Arena or other significant event, we extend our opening times, based on demand.